One of Niagara’s newer wineries located in the award-winning wine region, just outside of the town of St. David’s Ontario Canada. Coyote’s Run Estate Winery has received important awards on their small batch of hand crafted premium wines. All the wines produced are created with 100% Niagara grapes and are certified by the Vintners Quality Alliance(VQA). 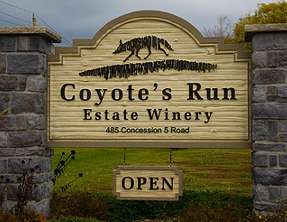 The great wines of Coyote’s Run Estate Winery are now available in LCBO Stores across Ontario, including the 2007 Unoaked Chardonnay and the 2007 Cabernet Wines. Coyote’s Run vineyard is a 58 acre property located in St. David’s, a small town outside of the city of Niagara-on-the-Lake, Ontario Canada. This land has always been used to produced some of the best grapes in Niagara. Coyote’s Run dedicated roughly 25 acres of the property to Pinot Noir, Chardonney, Cabernet Franc, Cabernet Sauvignon, Merlot, Syrah, Vidal, and Pinot Gris grapes. The vineyards ideal location allows the grapes to harvest 1 to 2 weeks earlier than most of the other vineyards because of the 2 to 3 degree increase in temperature compared to most wineries. Another advantage this winery has is the soil where the grapes grow, the heavy limestone clay. The vineyard is split into two sections of soil with one being dark limestone clay, for an earthy taste, and the rare red limestone clay, for a fruitier flavour. A tour through the vineyards at Coyote’s Run, the winemaking facilities and then a taste test of three premium wines. A 30 – 60 minute tour and tasting starting with the vineyard and ends with a tasting of 3 premium wines paired with premium cheeses.